'Avatar' is a visual epic. Avatar takes place on the lush alien world of Pandora, where the Na’vi live, beings who appear primitive but are highly evolved. 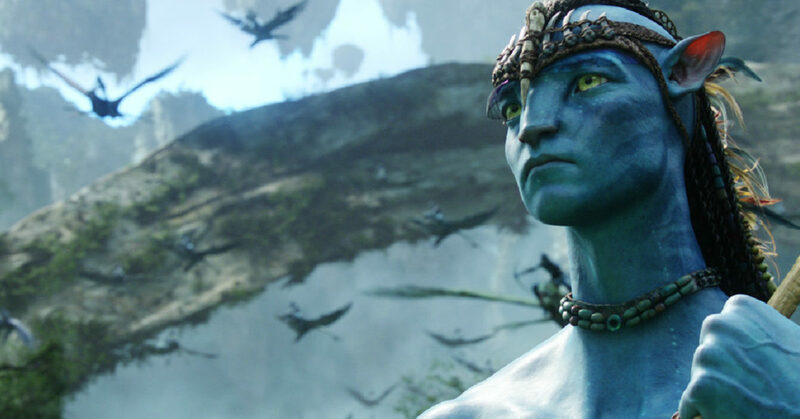 Because the planet’s environment is poisonous, human/Na’vi hybrids, called Avatars, must link to human minds to allow for free movement on Pandora. Jake Sully (Sam Worthington), a paralyzed former Marine, becomes mobile again through one such Avatar and falls in love with a Na’vi woman (Zoe Saldana). As a bond with her grows, he is drawn into a battle for the survival of her world. There are few, if any, words to describe the shear magnitude of awesomeness Avatar provides for a lover of cinema. It takes you back to that place where movies were meant to be seen on the big screen. No, not the big screen in your living room but the one at the cineplex. Avatar is an epic movie that will go down as a groundbreaking achievement in special effects. Every film in the future will be compared against it and the level in which they must reach to match its perfection in craft is immeasurable. The only downfall of the film is the lack of uniqueness to the actual plot. The man vs. nature, profit over humanity, and all the other tried and true themes that litter science fiction cinema are ever present. What makes Avatar so unique, though, is the visual imagery and creative imagination behind the spectacle that is the world of Pandora. Any misgivings you have with the plot and any moments you come across where you realize you may have seen this before in another film are all but disregarded. The experience of what you are seeing, hearing, and feeling take control instead. You do not care that the writing is sophomoric. Or how many of the characters are typecast to exist in a science fiction and/or action movie. The story keeps you engaged but it is the wonderment you feel and the awe inspiring effects that make it a movie you cannot wait to watch at home. It must be seen in the theatre, and in 3D preferably. If this is what moviegoers get every 12 years from Director James Cameron, plus around 300 million dollars, then we should all happily anticipate what he will deliver in 2021. I will be shocked if he can outdo himself but I am excited at the prospect. Have you ever gone to a movie that uses CGI and live action together on screen and felt something just does not quite match up? The plains are not smooth, there is a noticeable difference between what has been rendered in a computer and what has been shot in the “real” world. Welcome to a new era of special effects, live motion capture and CGI. In an epic film you expect an epic score. That one track where ten, twenty, even fifty years from now you will hear and immediately know the film it came from. Avatar does not have it. What it does have is a melting pot of very similar musical arrangements to other film scores. It is not copying them note for note but the similarities are evident to anyone who has ever seen some very popular movies over the past two decades. It does not take away from the experience because to be honest you really could care less with everything else that is going on but it is something that is sorely missing from making this film memorable on more than the special effects level. I did not breathe in the final battle scene – it was that good. My eyes were glued to the screen and blinking did not feel like an option for fear I would miss something. Avatar may not provide all that much full fledged action throughout but oh my, it makes up for it in the grandest of ways.